After the snow, hail and thunder of Thursday, and a miserable Friday, Saturday turned out bright and mild. As I approached Abergavenny though, low cloud cover increased and the temperature dropped. The cloud was beginning to lift by the time the race started, but Gary P helpfully pointed out the snow on a neighbouring hilltop, somewhat lower than the Sugar Loaf, whose summit was still obscured. The race started on the flat – wet soccer pitches, but quickly starts climbing, up road, then lane, then into woods before we emerged onto the ridge leading up to the summit, which by now was clear and we were running in pleasant sunshine, which meant a change out of my incognito kit (ski hat and loose waterproof top) to reveal my Croft vest and shorts. A loose horse trotted along just ahead of me, looking back every now and again as if to say, ‘come on I want a gallop’, but I couldn’t oblige, concentrating as I was on having enough energy to reach the summit. From the top its a bit of a scramble for the first few hundred yards, then the track becomes more runnable, which passing runners obviously appreciated more than me! There was one last rise on the road, half a mile from the finish, which brought me down to walking pace, and losing 20 seconds or so. A yell from Sue on the finishing line caused me to accelerate (the horse still wouldn’t have been impressed! ), in order to stay ahead of a couple of runners just behind, happily chatting as they bore down on me. 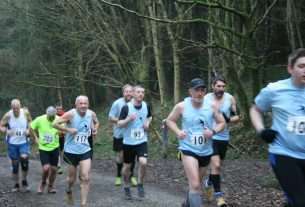 James Blore (Chepstow Harriers) was first of the 122 starters, in 52.48, with Gary P doing well to finish 45th (65.47) just ahead of Paul C-D, now a member of Mynydd Du. Sue had a really good run, 70th in 73.53, a whisker (flowing lock?) behind Steve H, with Mark and his ankle also surviving the testing course in the admirable time of 74.44 (75th). I was the last of the Croft contingent, 85th, in 77.37, and not the oldest competitor – he was an 80 year old, bravely tackling the 11.2 km course, with 525m of ascent, finishing last but not giving up. Something for me to aim for in a few years!